Judith Miller's A Shining Light is part of the Home to Amana series. In 1890, Andrea Wilson has returned home to Iowa with her young son after her husband has been lost at sea. Trying to start over and regain her footing, Andrea relies on the support of her community to see her through this and other heartbreaking events: the death of her father and the family's farm burning down. 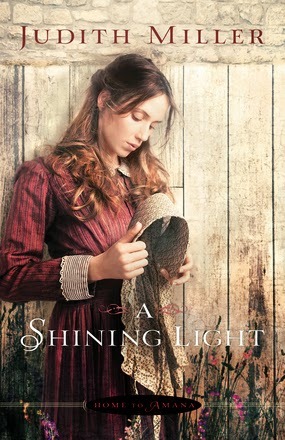 Narrated in first-person and written in a style that combines natural language with some antiquated phrases, A Shining Light is easy to read, yet well-written. The vivid descriptions of the settings, down to the details of the foods they eat, immerse readers into the time period of the late 1800s. It seems like the author did a lot of research to ensure historical accuracy. The fully-developed characters, combined with the intriguing storyline, combined with the other elements I've mentioned, make A Shining Light a good read all around. And, it is a fully stand-alone book if you haven't read the rest of the series.